Art teacher, Frank Juarez, will be co-presenting on a project that he collaborated in with three different schools from across the state. 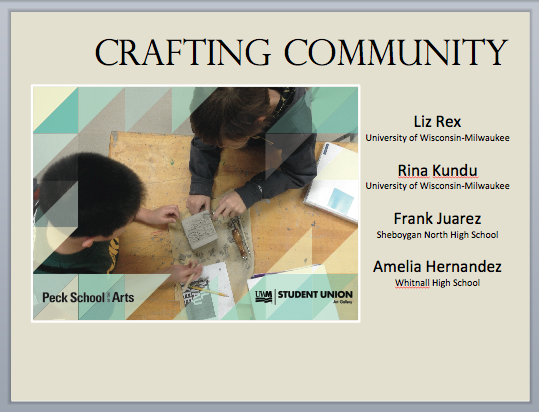 The project is called, “Crafting Community: Ceramics and Pedagogy in Greater Milwaukee”. This presentation is one of three that we will be presenting on at the Wisconsin Art Education Association Annual Fall Conference in Milwaukee. Description: The presentation introduces educators to artists who embrace the importance of art education, believe that their art experience was influenced or shaped by their K-12 art education, and are following their artistic dreams. The visits described will depict a close and personal approach into the studio lives of artists. Featured summer 2014 artists are Josh Wilichowski (MN), Vincenzio Donatelle (MN), Jane Ryder (IA), Jamie Bates Slone (MO),Catie Miller (MO), Todd Mrozinski (WI), Josie Osborne (WI), Paula Schulze (WI) andSuzanne Torres (WI). The MAS Project received grants from the Kohler Foundation, Inc and the Wisconsin Art Education Association.